I have to warn you. If you spend any amount of time with me… I will most likely… invite you somewhere. Church, a baseball game and a family dinner/parade/party/tradition usually top the list. But this invitation habit doesn’t stop at my personal life. It extends far and wide, and today I’m inviting you, yes all of you, to some really cool word nerd events. For the record, you’ve been warned. Proceed at your own risk. Fun, opportunities, merriment and writing improvement may lay ahead. Love a good story? How about a good cold adult beverage? Good news, you can get them both in the same place this Thursday night, September 21. 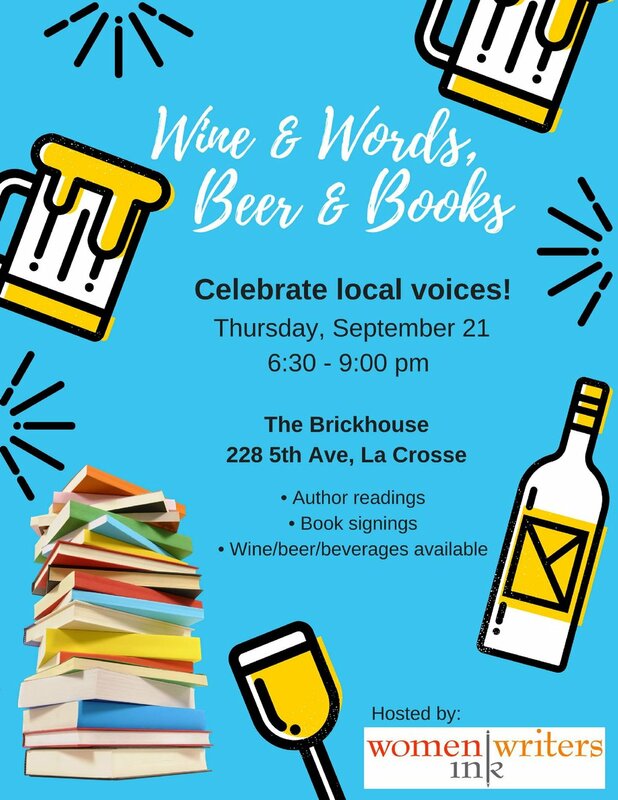 At The Brick House in downtown LaCrosse, 12 local authors, including yours truly, will be reading short excerpts from their book, and also selling their titles at this second annual event. Sponsored by my writing club, Women’s Writers Ink, this is sure to be a fun night. Click here for more info. During the entire month of October I will be facilitating an online writing community. If you have an idea for a story, but aren’t sure what to do with it or how to get started… this is for you! If you need a kick in the pants to get your daily writing habit back on track, this is for you. If you have a sequel that should have been started yesterday… guess what? Story Seedlings is for you! During the month you will write 22 scenes for your story and be given feedback (by myself and other participants) on your work. You will also get the opportunity to virtually hang out with some pretty awesome word nerds and make some new writing friends. If you are interested in learning more and signing up, click here. Only 8 spots still remain! On Saturday, October 21 from noon to 2pm, I will be sharing information about the Girl Scout programs I offer to help individuals and troops earn their badges. The expo will take place at Onalaska High School and is sponsored by the Badgerland Girl Scout Organization. If you are a troop leader, stop by and learn all about the fun reading and writing experiences I can offer. Click here for more info. Okay, so this one isn’t an event. It’s the opportunity to be a part of hundreds of events over the course of your writing career. This past weekend I attended my first SCWBI conference. It was three days of glorious word-nerdiness infused with the power of beautiful art. Through my time at the conference I was able to forge new connections, make new friends and create new possibilities. I would love to invite you to join this incredible organization so that next year at the fall conference, and at a bunch of other SCBWI events in between, you can do the same. Alright. That's all I got. I think. To be sure you don't miss any opportunities, check back on my events page from time to time. I hope you take me up on my invitations and that our paths are able to cross in the near future. Happy nerding friends!